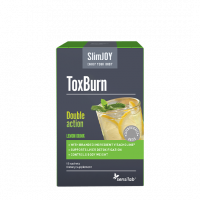 A delicious lemon drink with double effect: burning fat and eliminating toxins! This website requires cookies to provide all of its features. By using this website you are agreing with their usage. Some cookies have already been installed. 100% safe purchase and a 30-day satisfaction guarantee. Sensilab, the leading provider of products for a long, active and healthy life. All our dietary supplements are developed by experts of our research and development department. In accordance with GMP and HACCP standards; top ingredients only. Dietary supplement. Contributes to normal thyroid function. Maintains a natural balance of thyroid hormones. Aids the metabolism of macronutrients and carbohydrates. Complies with EU production legislation. If you aren’t satisfied with the product, you can return the box to us within 30 days, in accordance with our satisfaction guarantee, and we’ll refund you. Many people who suffer from hormonal disorders do not even know this! Weight gain without a change in lifestyle could be due to low levels of thyroxine (thyroid hormone). This controls the metabolism and represents the minimal amount of calories required to maintain basic bodily functions and processes without exercise or other activities. Statistics show that 1 in 8 women suffer from thyroid disease. Women are 8 times more susceptible than men. We have the solution – TiroLux! 100% natural product that helps people with problems caused by thyroid malfunction. 100% natural product with plant extracts that support thyroid function. A rich source of minerals, including iodine, which is essential for normal thyroid gland function. Along with iodine, this is a very important element for normal thyroid function. The main thyroid hormone T4 is composed of L-tyrosine and iodine. L-tyrosine is also involved in the production of hormones in the hypothalamus and pituitary gland. These hormones then stimulate the production of thyroid hormones. 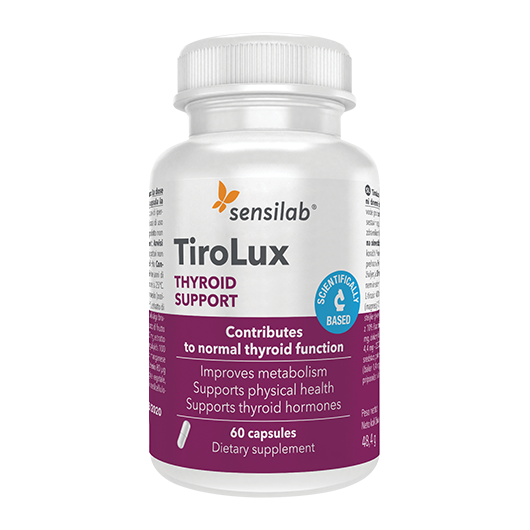 This ensures a healthy balance of thyroid hormones and the ability to absorb iodine. These are two plants with very adaptable properties. They regulate the body's response to stress, thus maintaining proper thyroid function and hormonal balance. HOW TO USE: The recommended daily intake is 1 capsule in the morning and 1 capsule in the evening, with a glass of water after a meal. WARNING: If you are hypersensitive or allergic to any of the product ingredients or use medication, consult your doctor before use. This product is not recommended for pregnant or breastfeeding women. IMPORTANT: The recommended daily intake should not be exceeded. Dietary supplements should not be used as a substitute for a varied, balanced diet and a healthy lifestyle, which are important. STORAGE: Keep out of the reach of children! Store in a dark, dry place at temperatures below 25°C. The effects of the product may vary between individuals and could differ from those described on the website. with customised offers and content, until I withdraw my consent. Do you have more questions about Sensilab products? Are you wondering what else you can do to improve your health and well-being? Write us at info@sensilab.uk, our experts will be happy to help.